We are in need of volunteers who will visit parishioners who are living in nursing homes. There will be a meeting on May 30 at 2:00pm in the Parish Centre for all those who have an hour or two to spare each week, and would like to make a difference in their lives. Volunteers must have a current Working With Childrens Check. Please leave your details at the Parish Office if you can help. Our Parish Bulletin is ‘our news’, and it would be wonderful to receive on a regular basis, reports of “your group’s”activities. All that’s needed is a short (100-150 words) report. Please take the time to let your fellow parishioners know of “your group’s” events. Who knows, someone may well wish to join you! 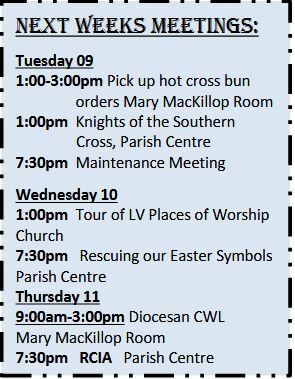 Parishioners and group leaders are asked to have items for inclusion in the Bulletin into the office by 10:00am on Thursday morning. We currently have a real need for people to volunteer as Lectors (Readers) and Commentators, especially at 6:00pm Mass on Saturday nights. Thanks to the few people who have responded with generosity to our plea. It would be marvellous to have two or three more volunteers. Training is available for anyone who is able to answer their baptismal calling in this service to the parish. Please contact parish office on 5174 2060 if you are interested. We are in need of volunteers to work in our Piety Stall for 10-15 minutes after each Mass. Volunteers will receive some training, and need to have a current Working With Children Check. You will be rostered on once per month. Please contact parish office for more details. It is currently very difficult for the parish to know when people are ill in hospital or at home. The ‘Catholic lists’ of yesteryear at the hospitals no longer exist. So, if there’s anyone in your family or anyone you know of who is unwell and who would welcome a visit from a parish representative or from Father, could you please let the office know by ringing 5174 2060. Our St Michael’s Parish Traralgon ‘App’ is ready! Availability of Mass times, parish information, bulletins and events and much more right on your phone!